I’m sporting the season’s hottest accessory – the boot. 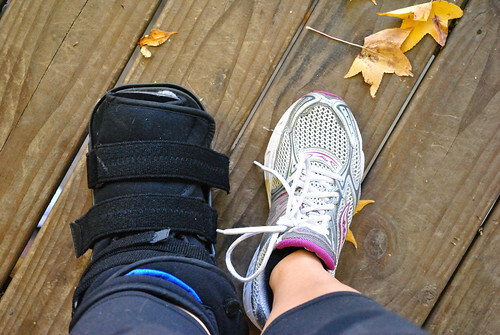 Unfortunately, I have a stress fracture in my left foot (my navicular bone to be exact). I have to admit -I kind of saw this coming. My ankle/foot/leg had been feeling off for the past month or so but I thought my runner’s knee was just acting up again and causing me to strain other parts of my leg. Long story short - I went in to my doctor on Friday, had a bone scan and CT and am now the (not so) proud owner of a boot for at least six weeks, and crutches for at least the next week. I’m slowly getting reacquainted with the gym to bike, swim, and strength train so that I can keep my sanity and indulge in some Thanksgiving goodies. So far, I have been able to keep up with my workout routine and most everyday things haven’t been a struggle. I only use the crutches part-time however, the boot is on almost 24/7 except to shower, swim, and sleep. It makes things a bit difficult since it’s quite heavy, awkward, and just generally irritating. Suffice it to say, by the end of the workday I’m generally exhausted and my mind is pretty spent. These past few days have taken a lot out of me both physically and mentally but I was determined to bake something this evening. 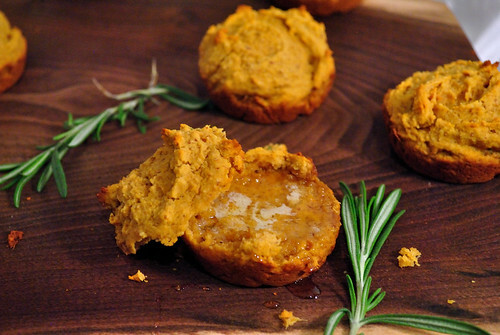 I went back and forth on what to make: vegan pumpkin mousse? Sweet potato casserole with meringue? Potato and leek gratin? All of these ideas required an extra trip to the store that I just didn’t have in me. After taking stock of what I had on hand, I finally decided to try my hand at some sweet potato biscuits. 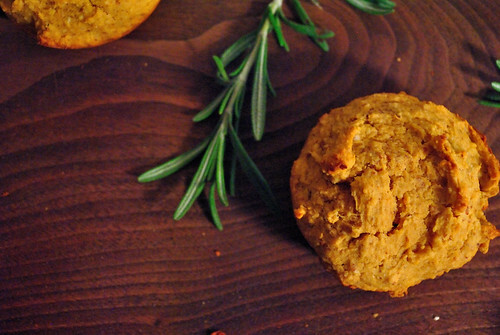 I needed simple, fast, comforting, and delicious and these biscuits are exactly that. 300g brown rice flour, finely ground + 200g almond flour + 200g oat flour from gluten-free oats + 300g potato starch. Combine, shake to incorporate, voila - all purpose flour mix. You can also use the original flours in this recipe. Don’t forget your flax seed either! It’s important because it helps give the biscuits a nice texture that is reminiscent of their gluten-filled cousins. This recipe makes six medium sized biscuit muffins so I highly recommend doubling it to make either six very large biscuits (increase your baking time by 5 minutes) or a dozen biscuits to share. 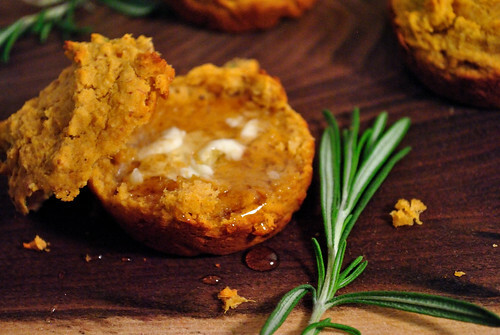 Bake up a batch or three because these biscuits are definitely Thanksgiving worthy. **Note: I simply microwaved a large sweet potato, let it cool, scooped out the flesh, and let it whirl around in my stand mixer until smooth. You can use canned if you like but fresh is best. 1. Preheat your oven to 375F and lightly grease your muffin tin. 2. Make your flax slurry and set it aside. 3. In a medium bowl, mix together your flours, baking soda, baking powder, salt, and pepper until well combined and aerated. 4. Mix together your wet ingredients (sweet potato, egg, honey, butter) in a stand mixer (or another large bowl) until smooth. 5. Add in flour mixture, rosemary, and flax slurry and mix until combined and smooth. The dough will be very sticky. 6. Scoop dough into muffin tins and fill just about half way. Fill up further if you want larger biscuits. 7. Bake for 15-20 minutes until a toothpick inserted in the center comes out clean. Remember, if you make your biscuits larger, increase your cooking time a bit. 8. Serve warm with honey and butter.